Ordering food online is a big trend. What started with a simple phone call has escalated to ordering on websites. Now people are ordering with the use of apps. For consumers, this is very convenient. For restaurant owners this can lead to logistic and implementation problems. Today’s consumers have become heavily dependent on the internet, smartphone apps and social media. This is where the newest trend for food ordering is coming into its own. The latest tech for restaurants focuses on making food ordering quick and fun with the use of online connections or apps. For some time now, fast food and restaurants have had website ordering systems for home delivery. These have now been supplemented by smartphone apps. The customer only needs to click on the right boxes, include the address, and the food would be delivered. The latest innovations let the user pay via Facebook or Amazon.com. TGI Fridays recently installed a system which bills the user’s Amazon account. The company has also partnered with Amazon and Facebook for online orders. These have proven to be very popular to their customers. TGI Fridays is casual dining, and they want to keep their customers loyal. They see that the way to do that is to keep up with technology. This includes online payments as well as loyalty rewards. Other restaurants have different approaches, that have met with varied successes. Domino’s and Papa John’s have always been delivery companies, the bulk of their sales have been phone ins. With the use of the new tech and methods, they have increased their sales. Papa John’s Pizza has been so successful in their efforts that they have declared that they are an “e-commerce company.” They have not released any sales figures, but that declaration may mean that a significant part of their sales is online, or that this will be the direction the company is taking in the future. For Domino’s, they have not been content with phone orders and apps. They have also implemented ordering via Amazon’s Echo and Google Home. This is new territory as both Echo and Home can be used to predict the correct order, as well as when the order will be sent. This makes a very compelling platform as it can be used to give reminders to regular customers. Of course, the reminder could come in the form of a calendar based alert or as a suggestion at a given time. Bold innovations are necessary for fast food and casual dining customers. If a millennial can order in advance from Starbucks, and pay for it through Amazon or any other pay facility, this could help in streamlining some operations, as well as ensure more sales. 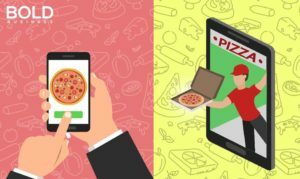 With the convenience of online ordering, in whatever form, the customer can have a better client experience with the food or restaurant company, as well as a better user experience on the smartphone. Online and app ordering for food and deliveries is a bold action. This is a hot trend that will certainly grow in the future.